Until now CACI facial toning technology has only been available at the world’s leading professional beauty salons, treatment clinics and spas. 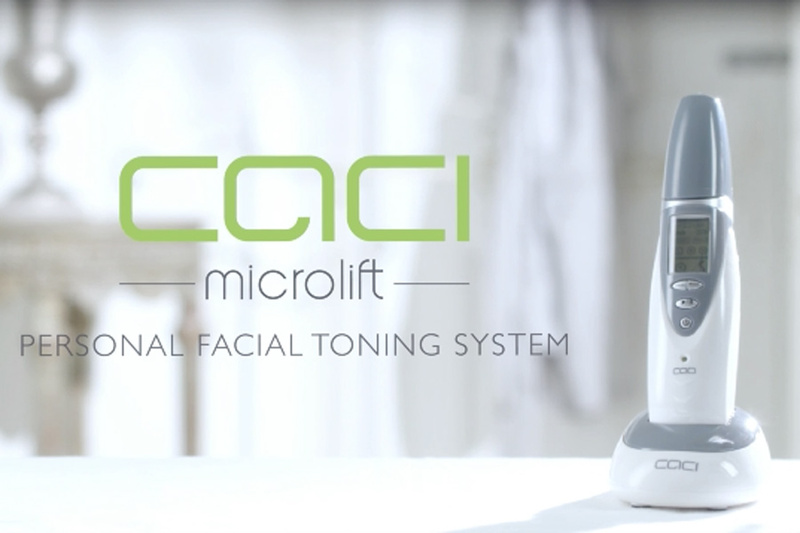 With the launch of the new CACI Microlift you can now enjoy the benefits of CACI facial toning in the comfort and convenience of your own home. This unique device is unlike any other home facial treatment system. The CACI Microlift uses a patented muscle gripping action in combination with microcurrent stimulation. These tiny electrical impulses work in harmony with the body’s bio-elctrical field to gently and painlessly help tone the face, soften the appearance of fine lines and wrinkles and improve skin texture to give a more youthful looking complexion. With dedicated treatment programmes to target both muscle tone and wrinkles, the CACI Microlift provides the ultimate 10 minute anti-ageing home facial routine. Ideal for maintenance between your salon treatments. Firm the jawline, plump the cheek area and lift the brow line. Reduce wrinkle depth by relaxing facial muscles. Soften the appearance of fine lines and improve skin texture for a more youthful looking complexion. Receive a 30 minute complimentary CACI treatment plus a free CACI Amino-lift Peptide worth £45 when you purchase the CACI Microlift from Benessere in Bromsgrove. I’ve been using CACI for years, since I started on GMTV to deal with my constantly tired eyes. The CACI home experience I love it’s a great top up for when I can’t get to a salon and so easy to use. I’m a big fan of CACI facials, I even have their portable Microlift machine at home. I was delighted when I heard that CACI was coming out with an at-home gadget because I think it works. It was the US dermatologist Dr Perricone who first put me on to CACI, as he recommends it as part of his skin-maintenance programme, but of course it’s almost impossible to get to a salon regularly enough. Once you get the hang of the Microlift, the machine is quite easy to use, I like to think of it as anti-ageing insurance.